LOOKING FOR A STORE NEAR YOU? click here! … and a ¼ teaspoon bamboo scoop (the amount needed for one cup) is included in every tin or pouch! This is our most popular size, and our most beautiful package. Completely free of a paper label that can deteriorate with time, our compact tins are keepsakes that can be used over and over again (Rooibos, 2 oz. 65 cups). This is a perfect option for ordering online to try our delicious blends, without buying a large minimum order. 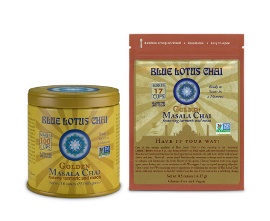 We are offering this simple package for those customers who love our chai and want to refill their own tins. 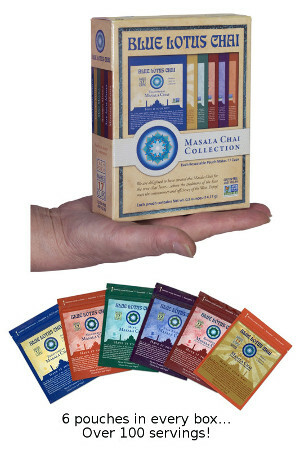 For our 6-count Variety Pack of Stand-Up Pouches click HERE! For our BLUE LOTUS CHAI APPAREL, click HERE! Available in 3 oz. tin (makes 100 cups) and ½ oz. pouch (makes 17 cups). Clicking the ‘Buy’ button opens a new browser tab; click ‘Continue Shopping’ to come back here. Available in 2 oz. tin (makes 65 cups) and ½ oz. pouch (makes 17 cups). Ingredients: Naturally brewed and flash-dried black tea powder; 100% Certified Organic powdered spices: ginger, cardamom, star anise, nutmeg, black pepper, cinnamon, cloves. We expect to be back in stock soon, late-May. Ingredients: Naturally brewed and flash-dried black tea powder; 100% Certified Organic powdered spices: ginger, cardamom, turmeric, maca, nutmeg, black pepper, cinnamon, cloves. An economical and delicious way to try all 6 of our masala chai varieties! 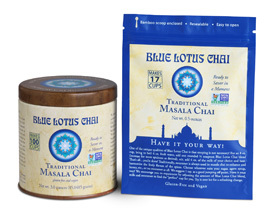 Each stand-up pouch makes 17 cups of our scrumptious chai. This is a perfect gift idea…for the holidays or any time (someone would love the addition of a couple of beautiful mugs)! Our products come in several different containers and sizes. We encourage you to buy directly from your local retailer (see our Store Locator to find a store near you). 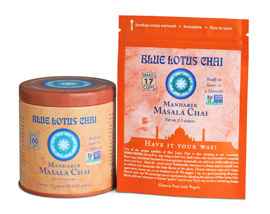 If your favorite market doesn’t already carry Blue Lotus Chai, you can simply request that they contact us to order some for their store. They can email us at info AT bluelotuschai.com . We are primarily wholesalers, desiring a limited internet business. We will ship our tins to you in minimum quantities of 4 or 12. If you would like to order individual tins online we suggest you visit one of our online retailers . 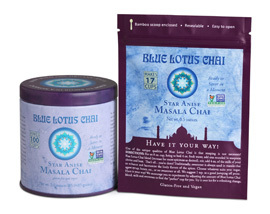 They are wonderful to do business with and can gracefully supply you with our chai in smaller quantities: Dana’s Healthy Home, ChaiDirect , and our Authorized Amazon Resellers.